This testimonials page has been divided up into two categories (as you can see from the tab names above)—those from clients and organizations that have hired me, and unsolicited reviews from audience members who have reached out to me after having seen one of my shows. Enjoy. I have to sheepishly admit that I'm not very good at keeping all of these testimonials together in one place, so if you would like to send me a review—whether you're a client or an audience member—please contact me via this website's contact page—click here. I hope to see you at one of my shows in the future! Your spirited, hilarious, brilliant and spellbinding performance helped to make RAPS first ever gala celebration unforgettable. Your exquisite voice, combined with your mastery of a whole gamut of performance wizardry, made for an awesome centerpoint of a great evening. It was an added bonus that you were such a pleasure to work with. The gala was also a great opportunity for a wonderfully diverse group of people to come together, have a few laughs, learn more about RAPS, bid on and win great items and go home knowing we all joined together in service of a great cause. You were a huge part of that. On behalf of PBS Systems, I would like to sincerely thank you for entertaining our clients and staff at our 2012 conference in Vancouver. After speaking with you and deciding to hire you for our conference, we were a little unsure of what to expect from the show and how it would be received by our customers. 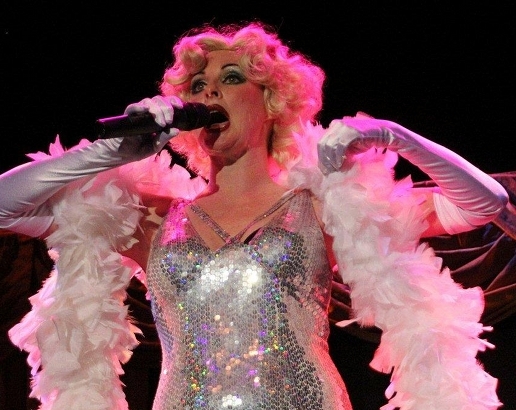 From the moment you entered as Marilyn Monroe, your Divas show was extremely entertaining. Not only did our customers enjoy the show, but you got them involved and interacting with yourself, and with each other. Each character that you performed was spot on. Not only are you a very talented singer, but I think everyone was pleasantly surprised by the comedy you provided. Everyone there was truly entertained and obviously loved the show, giving not one, but two, standing ovations. From start to finish, you were professional and accommodating. Once you were aware of the theme of our evening, you immediately knew which divas to perform. Then once you noticed our attendees were a little more relaxed, you made a couple of changes on the fly. Your quick thinking and comic skills made the show perfect. I would highly recommend you for any function and hope that we can use you again at some point in the future. 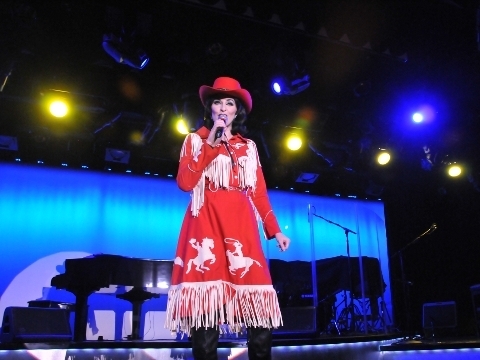 I have booked the acts for the Northern Lights Casino for 11 years and she is a first class act and one of the best. You are in every sense the consummate professional and a tremendous entertainer. We will be having you back again in the near future for another show for sure. For people who are thinking about hiring you and want a reference, please feel free to have them call me for a recommendation. Thank you ever so much for the terrific evening. We had the pleasure of working with Bonnie during a recent company event. 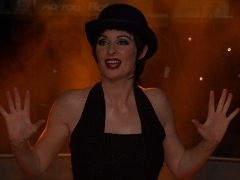 She is not only a fantastic entertainer, but was a huge asset during the planning and production of our event. From start to finish, she was flexible, detailed, reliable and never hesitated to go the extra mile to add sparkle and polish to our evening. A big thanks to you Bonnie! Bonnie was a joy to work with both prior and during the event. 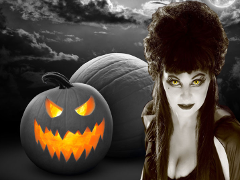 She is incredibly helpful and wants to ensure a successful event. Fabulous costumes and attention to detail, plus a beautiful voice. Bonnie's show rocks! Hilariously Funny...A real crowd pleaser. Our guests, staff, management, and I enjoyed every aspect thoroughly and would highly recommend her show to potential venues. Her level of professionalism and high standards was appreciated my all of us. We are sure to have her come out again in the future as her show can appreciated over and over. She was very quick on her feet and really engages the audience! Wow! You are the best. You are so professional and what could have been a wreck with the sound, you turned into extra comedy and we all need to laugh. Everyone was thrilled and will be talking about it for a long time as the best entertainment we have ever had. I really hope we can get you again in the future. I doubt if you ever need references but if you do have them contact me. Thanks so much we loved you! Bonnie Kilroe was just fabulous in every way! She approached us about doing a show at our venue. We checked out her website and were sufficiently impressed with her talent that we decided to take a chance on her. Kilroe was extremely helpful in providing all the marketing materials we needed and always responded to questions/requests in a timely fashion. Bonnie, who sings and voices all of her characters was amazing onstage!! She nailed the mannerisms and styles of the characters and really gave 100% of herself to ensure that the audience had a great time (which they did!). Guests that were in attendance that night are still talking about Bonnie’s wonderful show. Bonnie was a pleasure to work with and we will definitely have her back. "Bonnie did a wonderful job interacting with all the guests and the guests enjoyed her company. She was accomodating for the special requests of our event. She was very helpful when it came to taking photographs with the guests and even helpful in positioning the guests ensuring a great picture. I would hire Bonnie again in a heart beat! " 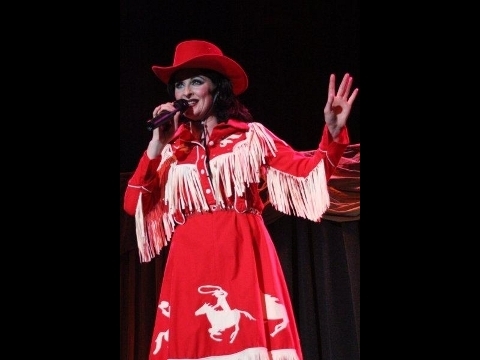 Bonnie is an ultimate entertainer who engages her audience in banter and comedy along with the amazing costumes and performance. Everyone that attended is still talking about the event! Everyone was thoroughly entertained and looking forward to having her back again. The performanc was like being in Las Vegas without leaving the comforts of our hometown! As the Entertainment Chairman I was very impressed with Bonnie's professionalism. Her stage set-up and her overall program were outstanding! I would highly recommend this entertainer for any venue. My wife and I had the pleasure assisting Bonnie and Joe set up, help with Bonnie's quick change of costumes and tear down after the show. 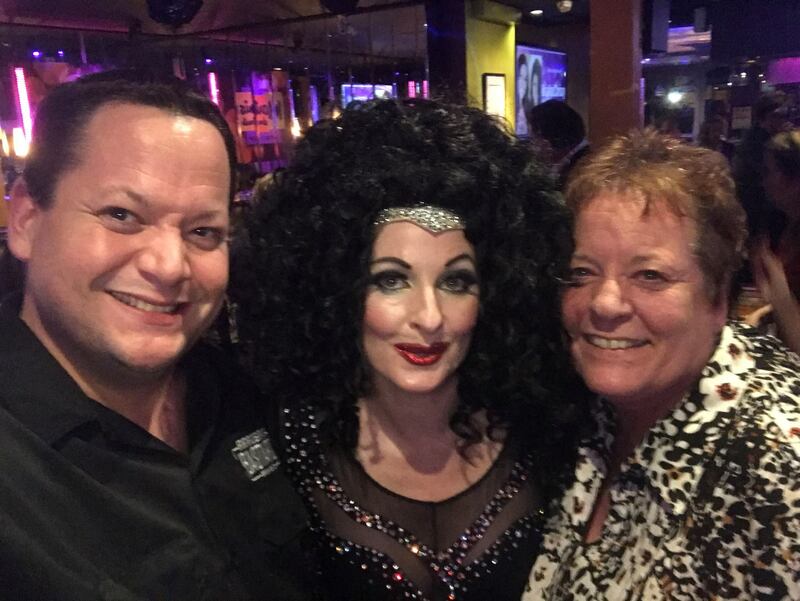 We had first hand, behind the scenes exposure to an amazing, well tuned, professional one woman impersonation show. Not only were we all amazed at Bonnie's comedic talent, voice range and dancing abilities,we were blown away at her well timed quick costume and character changes. Some in a little as a few seconds. How does she do that? Joe masters the sound and lighting with minor tweaking from Bonnie. And... they are really nice people to unwind with a drink afterwards! We will definitely bring Bonnie andher show back to Nova Scotia again. The word about town is spreading and many are sorry they did not see this fantastic engagement. If you have the chance, see this show. Thank you so much and looking forward to next time. It is a privilege to book Bonnie Kilroe under Ways and Means to raise funds for our Club. 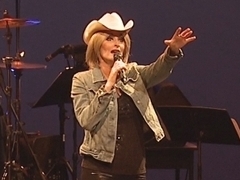 Bonnie went out of her way to promote the show by dressing up in costume and appearing at several functions close to promote the show. She was excellent in working with the press to promote her show. Our audience will never forget her excellent performance nor the laughter, thrill and delight of her professional entertainment. Her crew was very organized and blended with everyone and where consistent throughout the show. Bonnie is so easy to work with. I would highly recommend her. I would not hesitate to have her back to make another appearance. Her impersonations captivated the characters and with ease she had the audience participating throughout the show. "What an amazing night, your were fabulous! The comments from the guests were that they were thoroughly entertained by your show. You have a wonderful voice and captured everyone's attention. The night was an big success for the chorus, and on behalf of all of the boys, thank you for being a big part of that! I hope to see you again soon." "It is with great privilege that I write this letter in recommendation of Bonnie Kilroe. 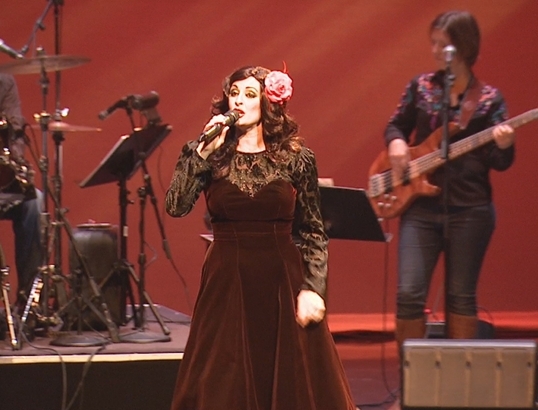 Bonnie performed at our fundraising event for the South Burnaby Neighbourhood House in February for a mixed audience of 250 people. As the feature entertainment of the evening, Bonnie’s performance was absolutely outstanding. Her ability to engage the guests while transforming into so many different characters was very impressive. The success of the evening was highly dictated by the quality of Bonnie’s performance and we received phenomenal feedback during and after the event. Bonnie began as “Marilyn Monroe” mingling with the guests during the cocktail hour, which really set the mood and tone for the evening, making all of the guests feel special. 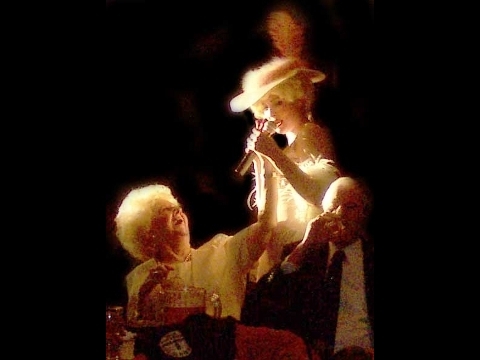 Her performance was approximately one hour in length following dinner and she was very skilled in choosing and encouraging guests to join her for various antics during the show. This also included a few VIP and politicians from the community where her interaction with them was very appropriate and professional. From the moment of first contact, to making arrangements with her, she was easy to work with and very enthusiastic every step of the way. It is without hesitation that I provide my recommendation for Bonnie Kilroe, who is not only a gifted and talented musician, but very charismatic and charming to win over a crowd!" "This letter of reference comes with the utmost highest recommendation. We brought in this show in two times. This class act show was put on to a sold-out crowd with a standing ovation and encores. Bonnie is one classy lady. This show is very classy and done in great style from the performance to the costumes. The crowd absolutely loved all the audience interaction and participation. We definitely look forward to booking more shows in the New Year." 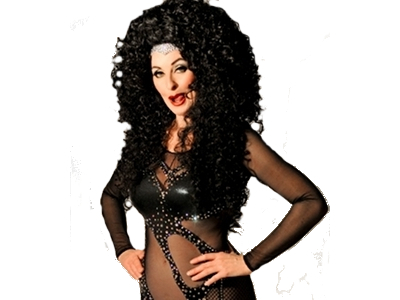 Our membership were thrilled with her show Vegas Meets Vaudeville, this lady is a powerhouse of energy a one person show, constantly on the move with lot's of audience participation with her Diva's. Tina Turner, Marilyn Monroe and Barbara Streisand, and many more, also she was available to visit with members taking the time to stop by each table. It was a pleasure to work with someone of her caliber and professional approach through out the process of booking her she is very easy to work with. We will be booking her again in the New Year by popular demand of the membership. It was so great having you here, I had a woman in last night hoping to make a reservation to see you again and she was quite disappointed you weren't coming back. You were one of the best acts I've brought in, People are still talking about you and will be for quite some time! "On behalf of the White Rock South Surrey Alumnae, we thank you for providing our wind-up dinner, June 14th, 2011, with such a wonderful evening of entertainment. You were so gracious to set-up to our needs of the evening. All the women at the evening loved the program. Raves and Raves to you! It was a pleasure to meet such a talented woman from the Vancouver area!!" "It was so much fun! I have recommended this to many friends for upcoming parties! she was so friendly and easy to talk to! We sang and danced...and what I really like is that she kept in contact with me and went to the restaurant to check out the area! Thank you!" "I was impressed with her professionalism in many ways. She spent the afternoon on location making sure the stage was set up to her standards and that the props and costumes were ready for the evening performance. Her stage presence is professional and attractive. She has a beautiful singing voice and her dancing was super. Her choice of celebrities complete with appropriate costuming was chosen with care. The show started on time and she captivated the audience. Her Burlesque Show was excellent too. Several ladies entertained the audience with their burlesque dances which were sensual but tasteful in appeal. This aspect of the show appealed to the "sin" part of our summer party and is appropriate for adult audiences who are familiar with and enjoy burlesque dancing. This troupe was also talented. 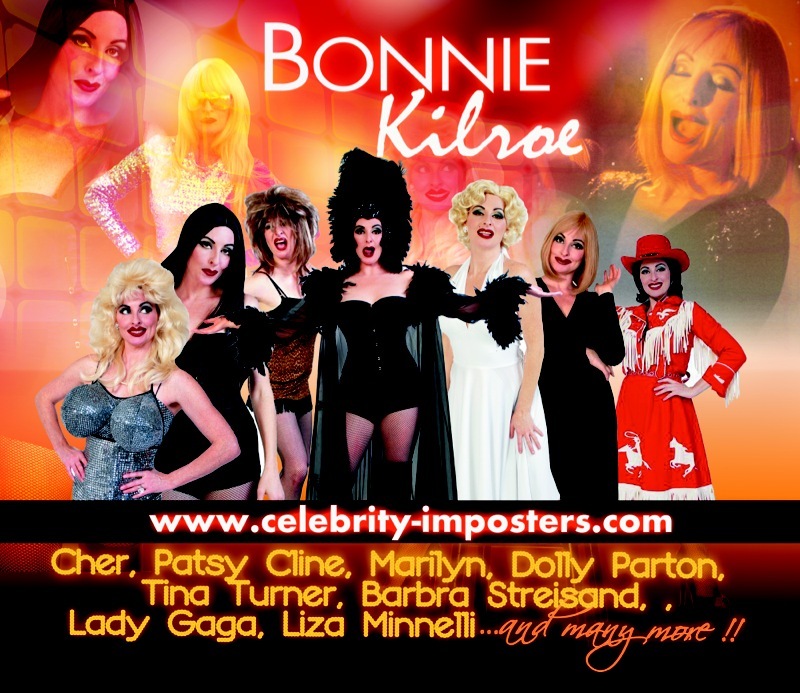 I would highly recommend Celebrity Entertainer Bonnie Kilroe for her talent and professionalism." 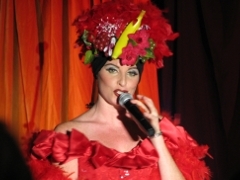 Bonnie Kilroe was a very prompt, courteous and professional entertainer. Bonnie jumped to be helpful and make the event come together. She then did one fantastic show bringing the audience to a wonderful and joyous New Year Celebration! Please use me as a reference. This is a letter of reference for Bonnie Kilroe. On Wednesday November 13th, the Firefighters Club had the opportunity to present “Celebrity Impostors”, a multi-impersonator show, put on by Ms. Kilroe. The feedback I received, on that evening as well as the following days, was nothing but positive. Bonnie Kilroe put on a great evening of entertainment; as well she was a great person to work with. I have nothing but positive things to say about our experience building up to, and during the show. 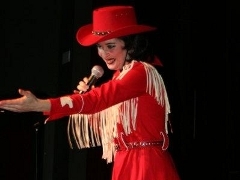 The Firefighters Club strongly recommends Bonnie Kilroe as an entertainer." From Patsy Cline to Lady Gaga or Cher, this remarkable woman pays what appears to be effortless homage to the magnificent talents of legendary entertainers with a stunning, “all her own” style of delivery that had my friend and I laughing, in tears and smiling all the way home from her performance at the Summit Theatre in Langley this past Sunday. With an innate flair for improvisation, Bonnie artfully graced the full house with a voice that yodels, warbles and moved us so that people in the audience wept and my spine still tingles at the thought of some of her high notes. If you are looking for something fun to do in Vancouver, you should check her shows out. 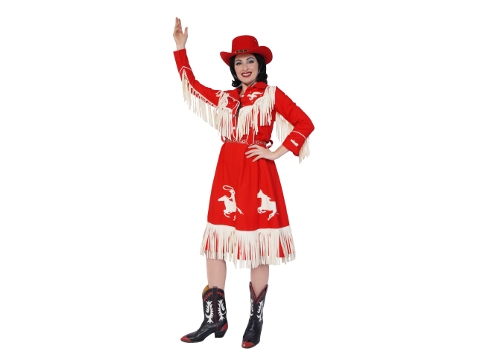 My friend is a die-hard Patsy Cline fan and was so overcome by the performance, she could only shake her head in awe. Truly blown away, and I'm sure many people witll be talking about that performance for ever! Way to go Bonnie, we had such a great time, you blew my Auntie's mind, literally! Anyone wanting to go to an amazing show, (she's coming back soon), trust me, you won't be disappointed. Highly recommend ii! Just love you Bonnie, you are the ultimate performer, thank you so very much...for everything!! Your show was the best that I have seen in along time.....one word to say...... WOW....you rock girl. Please if you get time go and see her. She saves the best for last. Just a note to say how much we enjoyed the show last night. In a word Phenomenal!!! Really like the changes you’ve made. We brought a new group with us this time and they all thoroughly enjoyed it as well. They could not get over the talent and energy you bring to the show. In fact we met one of them this morning and that’s all they could talk about! Thanks so very much for giving us another great night! You were fantastic and we can't wait till you come again. When you came out as Cher we were just amazed . Wow! All your impressions were awesome. Bonnie Kilroe, is an amazing performer. Her show is so full of fun, it's better than Disneyland!!! I can't wait until she comes back. Thank you for a memorable night. Amazing as always! This was my third time seeing her. It was her best show yet. What Christos Giannaris said! Excellent show! Come back soon! It’s the 4th time I’ve seen Bonnie she is amazing and the most talented person I know! Always a great show wonderful vocals and side splitting jokes! She knows how to entertain and work a crowd! I can't wait to see her again! I will always be there front the center each time she’s in town! I love her! There is no limit to the celebrities she can impersonate! And it’s live singing and original joke material! Is it next year yet? I can’t wait to bring the entire family again to see her! Thank you again Bonnie for an amazing night! Bonnie is always amazing! I've seen her 3 times and each time it was a different show. Always 2 hours of smiling and laughing. My friends and I always buy tickets for her so quickly. Please make sure she comes back! This was my 3rd time and it was AWESOME!! I had to get up at 4:30 the next morning and it was sooo worth it!! Love Bonnie!! She keeps it funny and fresh Every show is different. She has new celebrities and new jokes every time. I can't wait to see her again!!! I'm ready to buy my ticket now!! Your incredible voice and your spirit is unbelievably beautiful. Thank you again we had a blast singing and dancing to all those great songs last night. Great memories! I just wanted you to know how much we enjoyed your show last night. It just made our evening. You have a terrific way about you on stage and we left the Sid Williams in great spirits. Thank you for entertaining us at the Osoyoos Legion, People are telling me how much they enjoyed the show. You sang, made us laugh, amazed us and interacted with the audience..
A fun show. It was a pleasure to work with you and to be your quick change helper. Our reviews from the audience has shown that they greatly enjoyed the show. The music was fantastic and they really appreciated the crowd involvement. Some of our comments suggested that there could be more crowd involvement and others were very happy with the show as it was. Many comments indicated to us that they would be coming back to another of your shows. We found you and your husband to be very professional and accommodating to work with. Your requests on us were minimal. Thank you for producing such a wonderful show. I wanted to say what an awesome time I had at the Show in Vernon on Saturday night! And to think I almost didn’t go!!! *GASP* that would have been awful! (I just didn’t know how amazing and fun it was going to be!!!) You brought joy, laughter, fun, entertainment and excitement to the whole crowd! And youth, you brought so many people youth! That is a gift my dear that you have been blessed with J I just wanted to say thank you and keep up the good work. Keep making a difference in the world by making people smile, that is very special! So much fun. You are amazing. I am now a groupie!! She is a born entertainer and is a natural at interacting with the crowd.